Airport coffee doesn’t actually have to be good coffee. In fact the bar is set very low for food and coffee in airports. I suspect it has a lot to do with access to a captive audience waiting for a flight. When you are boarding in 30 minutes, you are unlikely to shop around much. Gourmet Cellars in the Sydney Domestic Terminal is actually not too bad. The cafe is located just near a bookshop tucked away from the main concourse. As the name implies, they had a surprisingly substantial wine list, even if they were light on food. The cafe uses Vittoria coffee and does a reasonable job with it. My long black was more or less OK, and was only slightly too bitter. Considering what some cafes do to Vittoria coffee, this was better than I was expecting. Unfortunately for me, their cake selection was poor to nonexistent and their food selection was just as slim. They did stock some biscuits and a few other nibbles, but nothing that appealed to me. The seating was OK, but like so many other places in an airport, they were short on power points. The day a franchise makes power points available at the table for their airport locations, they will make a killing. Unfortunately for my phone’s battery, Gourmet Cellar was not going to be the one to start this. 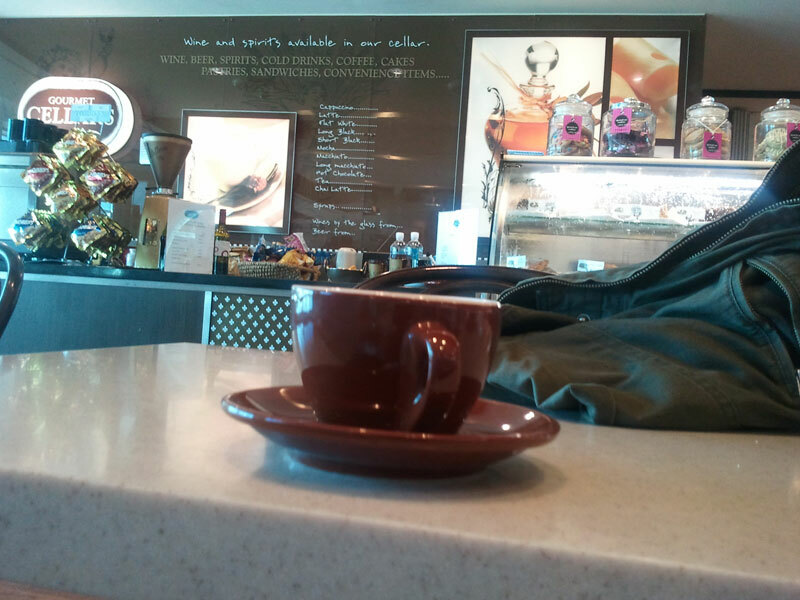 Why don’t airport cafes offer patrons power points at the table?